Seychelles ( ; French: ), officially the Republic of Seychelles (French: République des Seychelles; Creole: Repiblik Sesel), is an archipelago in the Indian Ocean. The 115-island country, whose capital is Victoria, lies 1,500 kilometres (932 mi) east of mainland Southeast Africa. Other nearby island countries and territories include Zanzibar to the west and Comoros, Mayotte, Madagascar, Réunion and Mauritius to the south. Some scholars assume that Austronesian seafarers and later Maldivian and Arab traders were the first to visit the uninhabited Seychelles. Remains of Maldivian mariner presence from the 12th century were found in Silhouette Island. The earliest recorded sighting by Europeans took place in 1502 by the Portuguese Admiral Vasco da Gama, who passed through the Amirantes and named them after himself (islands of the Admiral). The earliest recorded landing was in January 1609, by the crew of the "Ascension" under Captain Sharpeigh during the fourth voyage of the English East India Company. Britain eventually assumed full control upon the surrender of Mauritius in 1810, formalised in 1814 at the Treaty of Paris. Seychelles became a crown colony separate from Mauritius in 1903. Elections were held in 1966 and 1970. Independence was granted in 1976 as a republic within the Commonwealth. In 1977, a coup d'état ousted the first president of the republic, James Mancham, who was replaced by France Albert René. The 1979 constitution declared a socialist one-party state, which lasted until 1991. The first draft of a new constitution failed to receive the requisite 60% of voters in 1992, but an amended version was approved in 1993. In the 1980s there was a series of coup attempts against President France-Albert René, some of which were supported by South Africa. In 1986, an attempted coup led by the Seychelles Minister of Defense, Ogilvy Berlouis, caused President René to request assistance from India. In Operation Flowers are Blooming, the Indian naval vessel, INS Vindhyagiri, arrived in Port Victoria to help avert the coup. In January 2013, the country declared a state of emergency; the tropical cyclone Felleng caused torrential rain, and flooding and landslides destroyed hundreds of houses. State House, Victoria, the seat of the president. The Seychelles president, who is head of state and head of government, is elected by popular vote for a five-year term of office. The previous president, France Albert René, first came to power after his supporters overthrew the first president James Mancham on 5 June 1977 in coup d'état and installed him as president. He was at that time the current prime minister. He ruled under a dictatorial one party state communist system until in 1993 he was forced to introduce a multi-party system. He stepped down in 2004 in favour of his vice-president, James Michel, who was re-elected in 2006 and again in 2011. The unicameral Seychellois parliament, the National Assembly or Assemblée Nationale, consists of 34 members, of whom 25 are elected directly by popular vote, while the remaining nine seats are appointed proportionally according to the percentage of votes received by each party. All members serve five-year terms. The primary political parties are the ruling socialist People's Party (PP), known until 2009 as the Seychelles People's Progressive Front (SPPF), and the socially liberal Seychelles National Party (SNP). 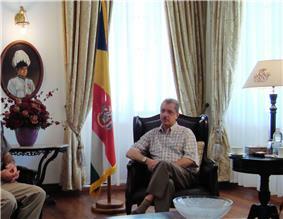 Politics has been an integral part of the lives of the Seychellois since its inception in the early sixties. Seychelles is part of the Indian Ocean Commission (IOC), La Francophonie and the Commonwealth of Nations. Seychelles is divided into twenty-six administrative regions that comprise all of the inner islands. 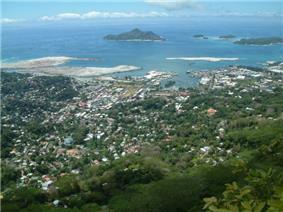 Eight of the districts make up the capital of Seychelles and are referred to as Greater Victoria. Another 14 districts are considered the rural part of the main island of Mahé with two districts on Praslin and one on La Digue which also includes respective satellite islands. The rest of the Outer Islands (Îles Eloignées) are the last district, recently created by the tourism ministry. President James Michel in his office in Victoria, 2009. Until the mid-19th century, little formal education was available in Seychelles; the Catholic and Anglican churches opened mission schools in 1851. The Catholic mission later operated boys' and girls' secondary schools with religious Brothers and nuns from abroad even after the government became responsible for them in 1944. A teacher training college opened in 1959, when the supply of locally trained teachers began to grow, and in short time many new schools were established. Since 1981 a system of free education has been in effect requiring attendance by all children in grades one to nine, beginning at age five. Ninety percent of all children attend nursery school at age four. Currently the public school system consists of 23 crèches, 25 primary schools and 13 secondary schools. The schools are on Mahé, Praslin, La Digue and Silhouette. The total school that available in this country is 68. There are three private schools: École Française, International School and the Independent school. All the private schools are on Mahé, and the International School has a branch on Praslin. There are seven post-secondary (non-tertiary) schools: the Seychelles Polytechnic, School of Advanced Level Studies, Seychelles Tourism Academy, University of Seychelles Education, Seychelles Institute of Technology, Maritime Training Center, Seychelles Agricultural and Horticultural Training Center and the National Institute for Health and Social Studies. The current administration has advanced plans to open a university in an attempt to slow down the brain drain that has occurred. University of Seychelles, initiated in conjunction with the University of London, is launching education programmes which will include teaching and lead to the award of the recognized qualifications from the University of London. Dense forests on Mahé Island. An island nation, Seychelles is located in the Indian Ocean, and is northeast of Madagascar and about 1,600 km (994 mi) east of Kenya. The archipelago consists of over 116 islands. The granitic islands are considered the oldest and hardest granite in the world. The majority of the islands are uninhabited, with many dedicated as nature reserves. The islands as per the Constitution are divided into groups as follows. There are 45 granite based islands known as the Granitic Seychelles. These are in descending order of size: Mahé, Praslin, Silhouette Island, La Digue, Curieuse, Felicite, Frégate, Ste-Anne, North, Cerf, Marianne, Grand Sœur, Thérèse, Aride, Conception, Petite Sœur, Cousin, Cousine, Long, Récif, Round (Praslin), Anonyme, Mamelles, Moyenne, Eden, Ile Soleil, Romainville, Île aux Vaches Marines, L'Islette, Beacon (Île Sèche), Cachée, Cocos, Round (Mahé), L'Ilot Frégate, Booby, Chauve Souris (Mahé), Chauve Souris (Praslin), Île La Fouche, Hodoul, L'Ilot, Rat, Souris, St. Pierre (Praslin), Zavé, Harrison Rocks (Grand Rocher). There are 29 coral islands in the Amirantes group, west of the granitics: Desroches, Poivre Atoll (comprising three islands—Poivre, Florentin and South Island), Alphonse, D'Arros, St. Joseph Atoll (comprising 14 islands—St. Joseph Île aux Fouquets, Resource, Petit Carcassaye, Grand Carcassaye, Benjamin, Bancs Ferrari, Chiens, Pélicans, Vars, Île Paul, Banc de Sable, Banc aux Cocos and Île aux Poules), Marie Louise, Desnoeufs, African Banks (comprising two islands—African Banks and South Island), Rémire, St. François, Boudeuse, Etoile, Bijoutier. There are 13 coral islands in the Farquhar Group, south-southwest of the Amirantes: Farquhar Atoll (comprising 10 islands—Bancs de Sable Déposés Île aux Goëlettes Lapins Île du Milieu North Manaha South Manaha Middle Manaha North Island and South Island), Providence Atoll (comprising two islands—Providence and Bancs Providence) and St Pierre. There are 67 raised coral islands in the Aldabra Group, west of the Farquhar Group: Aldabra Atoll (comprising 46 islands—Grande Terre, Picard, Polymnie, Malabar, Île Michel, Île Esprit, Île aux Moustiques, Ilot Parc, Ilot Emile, Ilot Yangue, Ilot Magnan, Île Lanier, Champignon des Os, Euphrate, Grand Mentor, Grand Ilot, Gros Ilot Gionnet, Gros Ilot Sésame, Heron Rock, Hide Island, Île aux Aigrettes, Île aux Cèdres, Îles Chalands, Île Fangame, Île Héron, Île Michel, Île Squacco, Île Sylvestre, Île Verte, Ilot Déder, Ilot du Sud, Ilot du Milieu, Ilot du Nord, Ilot Dubois, Ilot Macoa, Ilot Marquoix, Ilots Niçois, Ilot Salade, Middle Row Island, Noddy Rock, North Row Island, Petit Mentor, Petit Mentor Endans, Petits Ilots, Pink Rock and Table Ronde), Assumption Island, Astove and Cosmoledo Atoll (comprising 19 islands—Menai, Île du Nord (West North), Île Nord-Est (East North), Île du Trou, Goëlettes, Grand Polyte, Petit Polyte, Grand Île (Wizard), Pagode, Île du Sud-Ouest (South), Île aux Moustiques, Île Baleine, Île aux Chauve-Souris, Île aux Macaques, Île aux Rats, Île du Nord-Ouest, Île Observation, Île Sud-Est and Ilot la Croix). The climate is equable although quite humid, as the islands are small, classified by Köppen-Geiger system as tropical rain forest (Af). The temperature varies little throughout the year. Temperatures on Mahé vary from 24 to 30 °C (75 to 86 °F), and rainfall ranges from 2,900 mm (114 in) annually at Victoria to 3,600 mm (142 in) on the mountain slopes. Precipitation is somewhat less on the other islands. During the coolest months, July and August, the average low is about 24 °C (75 °F). The southeast trade winds blow regularly from May to November, and this is the most pleasant time of the year. The hot months are from December to April, with higher humidity (80%). March and April are the hottest months, but the temperature seldom exceeds 31 °C (88 °F). Most of the islands lie outside the cyclone belt, so high winds are rare. During the plantation era, cinnamon, vanilla and copra were the chief exports. In the 1960s, about 33% of the working population worked at plantations, and 20% worked in the public or government sector. In 1965, during a three-month visit to the islands, futurist Donald Prell prepared for the then crown colony Governor General, an economic report containing a scenario for the future of the economy. In 1964–65 the Seychelles connection to the outside world consisted of (1) excellent telegraphic service, (2) weekly seaplane service from Mombasa, Kenya, and (3) a monthly visit of the 10,304 ton British India Line's passenger ship M.S. Kampala. Mahé, Seychelles was a stopover port on the ship's round trip voyage from Mombasa, to Bombay. The island's population of 47,000 was about half of what it grew to be in 2011. In 1964, the major sources of funds supporting the island's economy included: (1) Agricultural exports, Rs. 8,660,000, (2) Grants in aid and other funding from British government, Rs. 2,920,000, (3) Funding from the United States covering the operating cost of the Indian Ocean Tracking Station, (part of the US Air Force Satellite Control Network), Rs. 4,500,000, (4) Invisible exports (funds received from sources outside the Seychelles) including, pensions and allotments to retired British expatriates, bank transfers from abroad and miscellaneous purchases, Rs. 3,260,000, and (5) Tourism, Rs. 860,000. The total value of imports (including freight, insurance) and miscellaneous funds transferred abroad, totalled Rs. 16,500,000, resulting in a surplus to the economy of Rs. 3,700,000. The report recommended establishing a Seychelles Development Corporation. The Indian Ocean Tracking Station on Mahé was closed in August 1996 after the Seychelles government attempted to raise the rent to more than $10,000,000 per year. 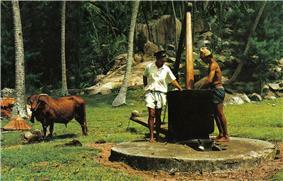 Coconut oil-making in the early 1970s. Since independence in 1976, per capita output has expanded to roughly seven times the old near-subsistence level. Growth has been led by the tourist sector, which employs about 30% of the labour force, compared to agriculture which today employs about 3% of the labour force. Despite the growth of tourism, farming and fishing continue to employ some people, as do industries that process coconuts and vanilla. The prime agricultural products currently produced in the Seychelles include sweet potatoes, vanilla, coconuts and cinnamon. These products provide much of the economic support of the locals. Frozen and canned fish, copra, cinnamon and vanilla are the main export commodities. 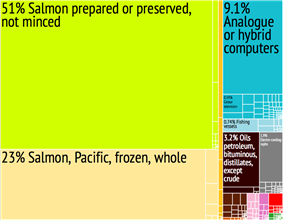 Graphical depiction of Seychelles's product exports in 28 colour-coded categories. When the British gained control of the islands during the Napoleonic Wars, they allowed the French upper class to retain their land. Both the French and British settlers used enslaved Africans and although the British prohibited slavery in 1835, African workers continued to come. Thus the Gran blan ("big whites") of French origin dominated economic and political life. The British administration employed Indians on indentured servitude to the same degree as in Mauritius resulting in a small Indian population. The Indians, like a similar minority of Chinese, were confined to a merchant class. Through harmonious socioecomic policies and developments over the years, today Seychelles is described as a fusion of peoples and cultures. Numerous Seychellois are considered multiracial: blending from African, Asian and European descent to create a modern creole culture. Evidence of this harmonious blend is also revealed in seychellois food, incorporating various aspects of French, Chinese, Indian, and African cuisine. As the islands of Seychelles had no indigenous population, the current Seychellois are composed of people who have immigrated. The largest ethnic groups were those of African, French, Indian, and Chinese descent. French and English are official languages along with Seychellois Creole, which is primarily based upon French, yet nowadays is often laced with English words and phrases. According to the 2002 census, most Seychellois are Christians: 82.3% are Roman Catholic, 6.4% are Anglican and 4.5% are of other Christian denominations. There are small minorities who practice Hinduism (2.1%) and Islam (1.1%). Other non-Christian faiths account for 1.5% of the population while a further 2.1% were non-religious or did not specify a religion. The median age of Seychellois is 32 years. 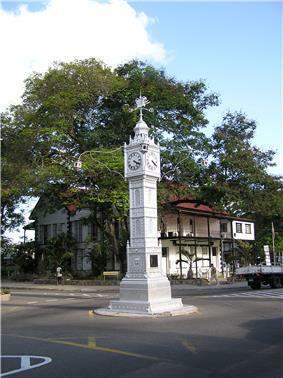 The district clock tower in the centre of Victoria, the capital of Seychelles. The music of Seychelles is diverse, a reflection of the fusion of cultures through its history. The folk music of the islands incorporates multiple influences in a syncretic fashion, including African rhythms, aesthetic and instrumentation—such as the zez and the bom (known in Brazil as berimbau), European contredanse, polka and mazurka, French folk and pop, sega from Mauritius and Réunion, taarab, soukous and other pan-African genres, and Polynesian, Indian and Arcadian music. A complex form of percussion music called contombley is popular, as is Moutya, a fusion of native folk rhythms with Kenyan benga. Kontredans (based on European contredanse) is popular, especially in District and School competitions during the annual Festival Kreol (International Creole Festival). Moutya playing and dancing can often be seen at beach bazaars. Their main languages are Seslwa Creole of The French Language, French, English Language. Environmental legislation is very strict, and every tourism project must undergo an environmental review and a lengthy process of consultations with the public and conservationists. The Seychelles is a world leader in sustainable tourism. The end result of this sustainable development is an intact and stable natural environment, which attracts financially strong visitors (150,000 in 2007) rather than short-term mass tourism. Since 1993 a law guarantees the citizens the right to a clean environment and at the same time obliges them to protect this environment. The country holds a record for the highest percentage of land under natural conservation—nearly 50% of the total land area. Anse Source d' Argent on La Digue. Like many fragile island ecosystems, the Seychelles saw the loss of biodiversity during early human history, including the disappearance of most of the giant tortoises from the granitic islands, the felling of coastal and mid-level forests, and the extinction of species such as the chestnut flanked white eye, the Seychelles Parakeet, and the saltwater crocodile. However, extinctions were far fewer than on islands such as Mauritius or Hawaii, partly due to a shorter period of human occupation (since 1770). The Seychelles today is known for success stories in protecting its flora and fauna. The rare Seychelles Black Parrot, the national bird of the country, is now protected. The granitic islands of Seychelles are home to about 75 endemic plant species, with a further 25 or so species in the Aldabra group. Particularly well-known is the Coco de Mer, a species of palm that grows only on the islands of Praslin and neighbouring Curieuse. 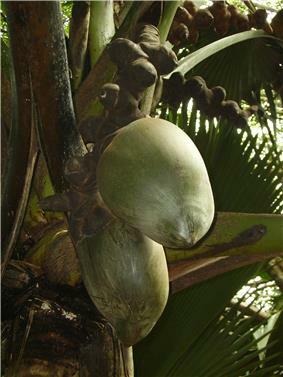 Sometimes nicknamed the "love nut" because of the shape of its fruit which, with the husk removed, presents a "double" coconut resembling buttocks, the coco-de-mer produces the world's heaviest seed pods. The jellyfish tree is to be found in only a few locations on Mahe. This strange and ancient plant in a genus of its own (Medusagynaceae) has resisted all efforts to propagate it. Other unique plant species include the Wright's Gardenia Rothmannia annae found only on Aride Island Special Reserve. The freshwater crab genus Seychellum is endemic to the granitic Seychelles, and a further 26 species of crabs and 5 species of hermit crabs live on the islands. The Aldabra Giant Tortoise now populates many of the islands of the Seychelles. The Aldabra population is the largest in the world. These unique reptiles can be found even in captive herds. 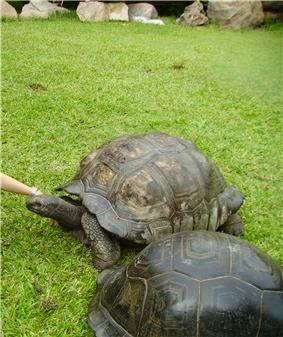 It has been reported that the granitic islands of Seychelles supported distinct species of Seychelles giant tortoises; the status of the different populations is currently unclear. Seychelles hosts some of the largest seabird colonies in the world. In the outer islands Aldabra and Cosmoledo are home to the largest numbers. 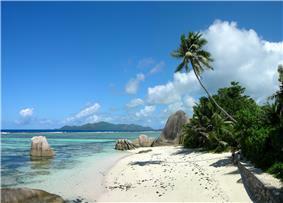 In granitic Seychelles the largest numbers are on Aride Island including the world's largest numbers of two species. The marine life around the islands, especially the more remote coral islands, can be spectacular. More than 1,000 species of fish have been recorded. Since the use of spearguns and dynamite for fishing was banned through efforts of local conservationists in the 1960s, the wildlife is unafraid of snorkelers and divers. Coral bleaching in 1998 has unfortunately damaged most reefs, but some reefs show healthy recovery (e.g., Silhouette Island). Although multinational oil companies have explored the waters around the islands, no oil or gas has been found. In 2005, a deal was signed with US firm Petroquest, giving it exploration rights to about 30,000 km2 around Constant, Topaz, Farquhar and Coëtivy islands until 2014. Seychelles imports oil from the Gulf in the form of refined petroleum derivatives at the rate of about 5,700 barrels per day (910 m3/d). In recent years oil has been imported from Kuwait and also from Bahrain. Seychelles imports three times more oil than is needed for internal uses because it re-exports the surplus oil in the form of bunker for ships and aircraft calling at Mahé. There are no refining capacities on the islands. Oil and gas imports, distribution and re-export are the responsibility of Seychelles Petroleum (Sepec), while oil exploration is the responsibility of the Seychelles National Oil Company (SNOC). ^ a b c d "Seychelles". International Monetary Fund. Retrieved 18 April 2013. ^ "Geoafrica.about.com". Goafrica.about.com. 9 July 2011. Retrieved 23 March 2012. ^ "History of Seychelles". seychelles.com. 2009. Retrieved 9 September 2010. ^ "africanhistory.about.com". africanhistory.about.com. Retrieved 23 March 2012. ^ "International Chapter activated for flooding in the Republic of Seychelles". United Nation. Retrieved 1 February 2013. ^ "State of Emergency declared in the Seychelles". Aljazeera. Retrieved 1 February 2013. ^ "Results reflect popular will, observers say". Seychelles Nation. Retrieved 30 May 2011. ^ "Seychelles re-elects President Michel". Reuters. 21 May 2011. Retrieved 23 May 2011. ^ "Vote buying claims mar Seychelles election". Agence France-Presse. Retrieved 23 May 2011. ^ U.S. Department of State. "Background Note: Seychelles". Retrieved 25 May 2010. This article incorporates text from this source, which is in the public domain. ^ "Climate". STGT.com. Retrieved 23 March 2012. ^ "World Weather Information Service – Victoria". ^ "SEYCHELLES INTL AP Climate Normals 1971–1990". ^ Prell, D. B. (1965). Economic Study of the Seychelles Islands. D.B. Prell. ^ "Seychelles economy – Seychelles Travel Guide". Seychellestour.com. Retrieved 23 March 2012. ^ "Culture of Seychelles". Everyculture.com. Retrieved 23 March 2012. ^ "CIA – The World Factbook". Cia.gov. Retrieved 23 March 2012. ^ "CIA.gov". CIA.gov. Retrieved 23 March 2012. ^ a b c Tartter, Jean R. "Status of Women". Indian Ocean country studies: Seychelles (Helen Chapin Metz, editor). Library of Congress Federal Research Division (August 1994). This article incorporates text from this source, which is in the public domain. ^ a b Country Reports on Human Rights Practices: Seychelles (2007) Bureau of Democracy, Human Rights, and Labor (11 March 2008). This article incorporates text from this source, which is in the public domain. ^ Haig, Janet (1984). "Land and freshwater crabs of the Seychelles and neighbouring islands". In David Ross Stoddart. Biogeography and Ecology of the Seychelles Islands.